In the beginning of 2000’s, the WinAmp was widely used software for playing MP3’s, with many of its plug-ins. One plug-in was particularly interesting: a DSP software called Izotope Ozone that altered the sound to resemble an old tube amplifier. As I mainly listen hard rock, this tube sound was something I immediately liked. After using the Ozone for a while, I become interested in tube audio and building my own amp became necessary. Although the Ozone models those old amps very well, the real thing is always a nice to have. What is a tube amplifier and what makes it better? 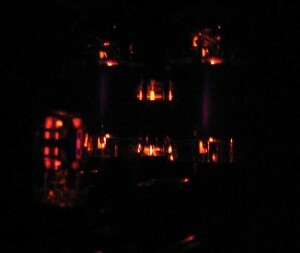 The vacuum tubes, a main ingredient when building a tube amplifier, are technology from the past. They were common before the transistors which revolutionized the electronics in 1960’s, making compact electronic devices and later microprocessors possible. The tubes itself are glass bulbs, similar to light bulbs, with glowing-hot metal parts, electrodes, inside. The heated parts emit a powerful electron stream which then travels inside the vacuum from electrode to another, controlled or modulated by a smaller input voltage, which makes them work as an switch or amplify a signal, similar to transistors. 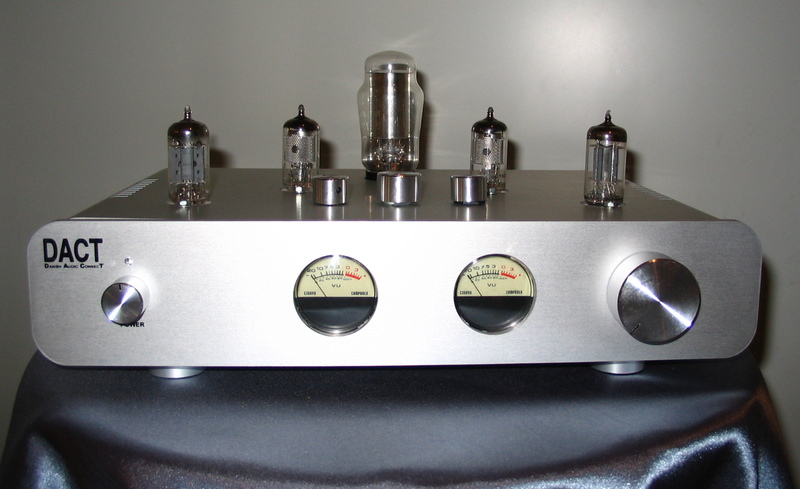 Building a power amplifier is not the only way to achieve the desired vintage sound. A vacuum tube pre-amplifier that is placed between a signal source and power amplifier that could be a modern solid-state one, produces the same sound with less expensive and safer construction. This approach was recommended for me by one Finnish vacuum tube professional, nick-named Tonskulus, who also kindly provided me the schematics and even tubes I needed. As this approach also did not necessarily require working with hazardous voltages, I chose this approach. The chassis of the amp was rather difficult to find. At first I was planning to build the amp inside of a chassis of an old Ethernet switch but it did not look good enough. I browsed the web for suitable chassis and found one, made of brushed and anodized aluminum by Danish company DACT. As at the time of making I had no drilling press, the chassis was prepared for circuit installation at a local metalwork shop by drilling the holes for tubes, VU meters, connectors and knobs. The schematic I got from Tonskulus, featured a pre-amp circuitry with bass and treble controls, built around small signal tubes EF85 and ECC83. The EF85 is a small-signal pentode and the ECC83 (also known as the 12AX7) is a dual triode that is even in 2013 very popular tube that is used widely in guitar amplifiers. They can still be purchased new. The tubes I have are 40 to 50 years old unused ones, that many consider better in terms of sound quality than the ones that are still made. A Philips 150C1 volt stabilizer tube was also added because of its nice looks; this gas-filled discharge tube glows purple when it operates. The circuit is assembled using a so called point-to-point topology; connecting the components directly to each other without circuit boards, like all of the old tube circuits found on old radios and other devices. It is not too beautiful but well, it works. The tubes require a low voltage supply to heat them up to their operating temperature and also a higher voltage supply to make the thermionic emission, the electron flow that makes them work, happen. The filaments are heated using 6,3 volts and the plate voltage that makes the electrons fly over the electrodes, is over 100 volts. As I was not familiar working with 230 VAC, I wanted a special arrangement instead of a basic line transformer and a rectifier. The tubes are supplied using a simple switch-mode boost converter that makes 170 volts out of 12 volt supply, which was also recommended to me by Tonskulus. It is built around the all-time favorite microchip, the 555 timer, operating as an oscillator to drive a mosfet. The FET charges an inductor and a capacitor, acting as a boost converter. The filament supply is made using LM317 voltage regulators. The whole power supply circuit is built on a stripboard and it is far from elegant but as my first electronics project it is sufficient. And most of all, it works. 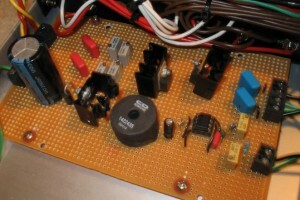 12 volts for the amp is supplied using an external ready-made power supply. Due to a rather high current required, finding a proper supply was quite difficult. I eventually found one that was made for portable refrigerators that also require low voltage but high current. The analog VU meters in front of the amp are for looks only. They are back-lit using blue leds and swing to the music. A vintage audio device is nothing without a pair of analog meters. 😉 They are driven using a pair of operational amplifier chips. The circuit is also constructed on a stripboard, like the power supply.